For luxury vacation rentals at greatly reduced rates, experience the beachside condos at Villa del Palmar. This Cabo beach resort is on pristine Medano Beach, the most popular and swimmable beach in Cabo San Lucas. The 5-Star beach resort enjoys a pleasant climate (almost 360 sunny days a year) and beautiful vistas. There are 3-BR, 2-BR Deluxe, 2-BR, 1-BR and Large Studio Suites, all fully furnished, complete with full kitchens. Discounted rentals are available on this website. For nearly a decade, savvy travelers have discovered how to save thousands of dollare by renting vacation time through BentonCabo. It's easy and every reservation in secured with a resort generated confirmation. No other site can offer you the low rates, personal service and expert Cabo advice that we offer! Feel free to call us and find out why vacationers "in the know" come back to us over and over again. Click here for Villa del Arco Beach Resort information. Click here for Villa del Palmar Flamingos Beach Resort information. This beach resort has 3 swimming pools, jacuzzis, room service, 2 restaurants, a grocery/deli market, 2 lighted tennis courts, purified water in every suite, and daily maid service. For all the amenities, see the Beach Resort Amenities page. The beach resort suites are all condos and have fully-equipped kitchens, satellite TV, linens and towels. For a complete list, see the Beach Resort Suites page. The European-style Spa at Villa del Palmar has a full range of services and treatments available. There are massages, body scrubs and treatments, facials, salon treatments, full gym, exercise classes, steam rooms and dry saunas. With over 9 resturants and bars to choose from on site, you'll love the variety and hospitality. As an option, an "All Inclusive Meal Plan" is now available. For details, see our FAQs page. At the Villa del Palmar Cabo San Lucas beach resort, vacationers can enjoy the best sport fishing (Cabo is known as "the marlin capital of the world"). World-class golf courses (some with ocean-front holes!) are nearby. Endless beaches and water sports include Scuba diving, snorkeling and swimming in the sparkling water. Umbrellas and lounge chairs are set up on the beach, and towels are provided. It's easy to rent the water toy of your choice, from high-powered Jet Skis or Sea Doos, to quiet self-powered sea kayaks. The bay is alive with watercraft, sea kayaks, catamarans and parasailors. This Cabo San Lucas beach resort also offers many land-based activities, including ATV tours, hiking, and sightseeing. There are lots of restaurants, night life, and bountiful shopping opportunities as well. The full-time entertainment staff provide a wide variety of on-site activities for Villa del Palmar guests. Many of the daytime activities are centered around the lower pool area. Also, a 9-hole mini-golf course, various classes, fashion shows, table games, books, and shuffle board are available. Dinner shows are provided most evenings of every week. For full details, see the Beach Resort Entertainment page. Everyday the Kids in Paradise program provides lots of fun activities for children ages 4 to 12. For more information about this and other children's activities, see the Beach Resort Children's Activities page. 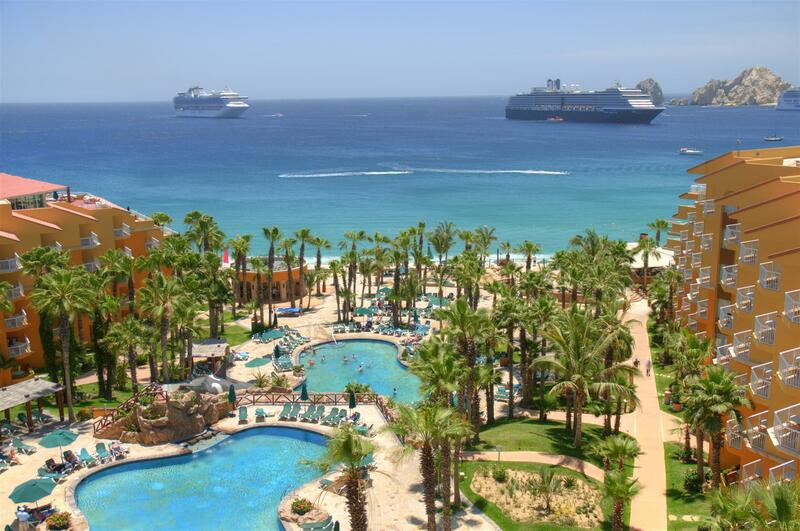 The Villa del Palmar Cabo San Lucas beach resort provides the setting for an unforgettable vacation experience. Just ask our many satisfied customers! Their comments can be found on the Reviews page. Check current Cabo San Lucas weather forecasts by visiting the Cabo San Lucas Info/Weather page. One of the newest Villa del Palmar resorts is Flamingos, located on the white sandy beaches in Nuevo Vallarta. This new Beach Resort is an all-suite, all ocean-view family beach resort. For information about the resort and the area, click on Villa del Palmar Flamingos Beach Resort. Another new 5-Star up-scale beach resort, close to Villa del Palmar Cabo, is Villa del Arco Beach Resort. The resort is designed as a family-oriented beach resort. This page features information about the resort. 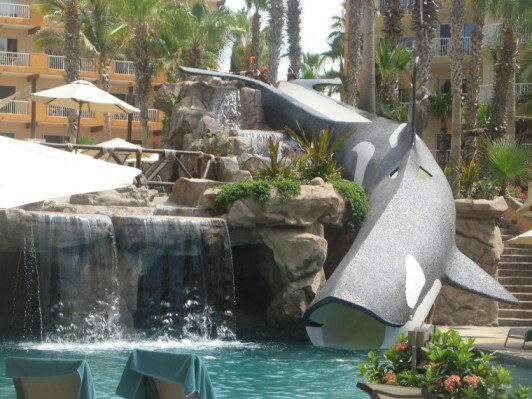 The iconic Willie The Whale slide at Villa Del Palmar Cabo. Incredible fun for kids of all ages...even Mom and Dad!